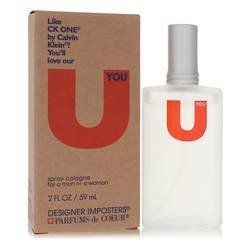 Designer Imposters U You Perfume by Parfums De Coeur 2 oz Cologne Spray (Unisex) for Women. Incorporating the same bergamot, lemon, mandarin, jasmine and lily of the valley scent notes that made Calvin Klein's CK One a hit, Designer Imposters U You elevates your self-confidence every time you splash a bit of the scent on your neck and wrists. Wear this fresh, clean scent from Parfums de Coeur to your next meeting to exude self-assurance, or use it before you meet with a big client to inject swagger into your step.